The Export Skid is a premium, reliable, complete reverse osmosis water purification system and water delivery system for use in commercial applications worldwide. This reverse osmosis system is more than just a reverse osmosis water filter system because contains everything needed to purify water and deliver water to the filling source, with the exception of water storage tanks. The Export Skid commercial water purification system is used in various applications worldwide requiring pure, high-quality, great tasting drinking water. The Export Skid is used in applications such as water purification plants, water stores, bottling plants, water pouch plants, beverage production, tech applications, manufacturing processes, pharmaceuticals, and other applications requiring purified water. This reverse osmosis water purification system is designed with a cartridge style pre-filtration system designed for use in areas with poor water quality and biological contaminants. Its design allows for trouble free low cost maintenance and eliminates the possibility of pre-filtration biological contamination. This along with its TFC membrane configuration allow it to consistently, reliably, and efficiently produce purified RO water under 10ppm. This can be easily configured with other components such as our Export Filler as well as configured to produce pure alkaline water. 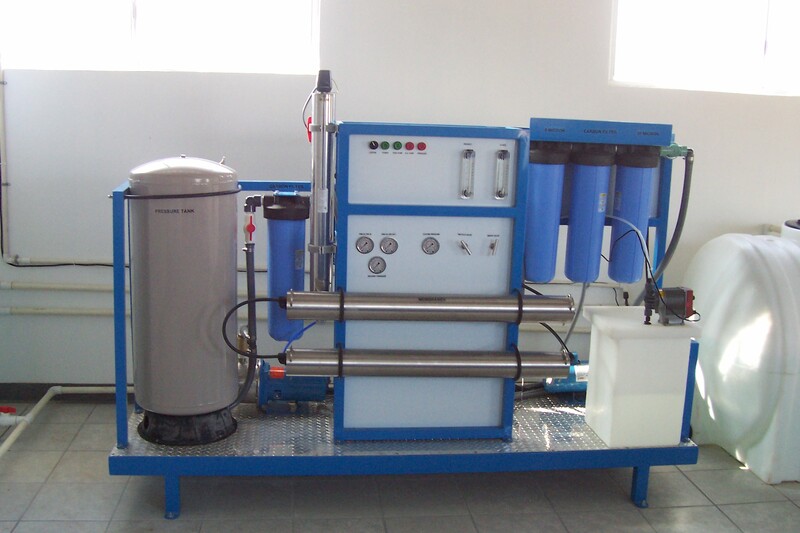 The Export Skid commercial reverse osmosis water purification system is built upon order allowing our technicians to optimize the system’s design for your specific application and needs. The Export Skid is very user friendly, reliable, and easily maintained and installed. It comes with a detailed operation guide outlining user instructions, maintenance, and installation procedures. The system carries a 1-year warranty on parts due to manufacturer defect and includes ongoing technical support. STEP 1: Pre-Filtration –cartridge type, removes particulate matter down to 20 microns. STEP 2: Carbon – an activated carbon cartridge filter that removes chlorine, chloramine, solvents, lead, insecticides, gasses, and other harmful contaminants. Works as a water softener, without the use of salt and drawing hardness particles together and crystallizing them. STEP 3: 5 Micron Pre-Filter – removes particles, sediments, and algae. STEP 4: R.O. Pump – high pressure, stainless steel pump to boot water pressure to 160 lbs. for maximum membrane efficiency. STEP 5: Reverse Osmosis Membrane – water is forced through a semi permeable, .0002 micron membrane, allowing only pure water molecules to pass. STEP 7: Repressurized System – 12 GPM pressure pump assures constant water supply from storage tanks to post carbon filter, ultraviolet sterilizer, and faucets. STEP 8: Pressure Tank – 32 gallon pressure tank assures a constant flow of water to the filler and prolongs pump life. STEP 9: Post Carbon Filtration – water travels through a post carbon filter, polishing it for an exceptionally smooth taste. STEP 10: Ultraviolet Sterilizer – stainless steel sterilizer eliminates up to 99.9% of all bacteria. STEP 11: Optional – ozone may be added to water storage tanks to prevent future bacterial growth. *Note: System flow rates are calculated based on a 24 hour day and 77 degree Fahrenheit incoming water temperature. Please call or email with any questions regarding equipment, applications, installation, or any other inquires. Our friendly customer service and sales associates can be reached during our normal business hours; Monday-Friday 8am-5pm PST. For best results we advise you to obtain a water analysis test to determine which contaminants are present in the water supply. You can reference our Water Problems page or call our customer service personnel to get a better understanding of contaminants and their effects.